Need a creative idea for leftover salmon? 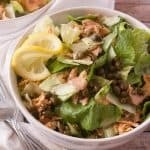 Try my Salmon Piccata Salad! You’ll love this dinner salad tossed with salmon and drizzled with two dressings! Prepare the piccata sauce as follows: Heat 1 Tbs. Butter to a sizzle in a small saucepan over medium heat. Add the garlic and saute’ it for about 30 seconds. Add the white wine and simmer it until it is almost completely evaporated. Add 3/4 cup of the chicken broth and the 1/4 cup of lemon juice. Simmer for 4 minutes. Whisk the teaspoon of cornstarch into the remaining chicken broth and whisk into the sauce. Simmer a couple minutes to thicken. Remove from the heat and prepare the other salad ingredients. Toss the lettuces and flaked salmon together and arrange on a dinner plate or salad bowl. Drizzle the salad with both the warm piccata sauce and the french vinaigrette. The salmon fillets should preferably be lemon pepper flavored but it’s not required. To prepare lemon pepper salmon see my Salmon Piccata recipe.